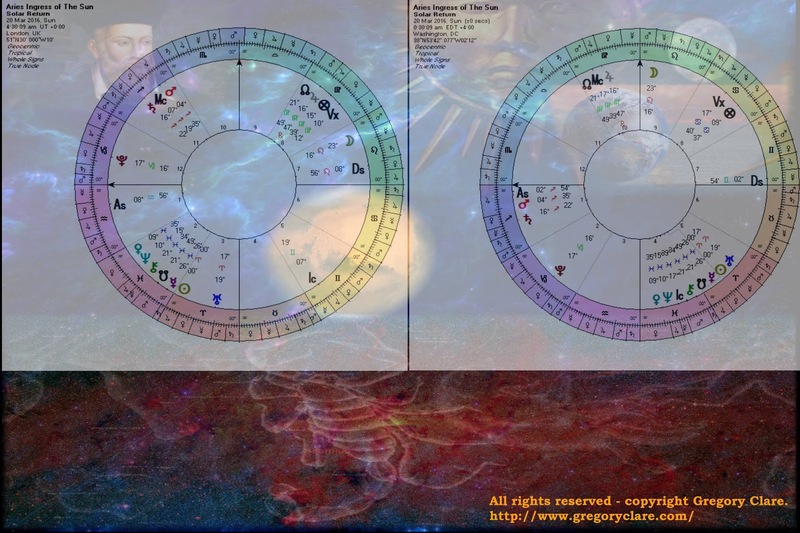 On the eve of the Earth/Sun equatorial marriage on horizon line, our forbears suggested to consider the state of the "Heavens above" for any signs or clues that may indicate the condition of the coming year ahead. And also to study the closest lunation to this passage, Aries ingress of the central Light, Sun. The chart can be cast for the place you would like to examine - location specific. Looking at the USA, UK and making use of the now capital Washington DC and London we find two difficult planets rising & culminating. Upon the Archer - Sagittarius rising is the fiery planet Mars & the detached frosty Saturn. Both planets speeds are very slow with Saturn 5days from station RX and Mars 28 days from the same condition. Mars & Saturn are receiving dexter square rays from the lord, Jupiter. Jupiter is co-joined to the North Node & its condition is weak by sign placement but very strong by angularity. So what are we to make this inauspicious ominous rising? The chart is deemed nocturnal as the Sun is below the Horizon, leaving the Moon as the Light Leader. The Moon is in the whole sign 9th place in the domicile of the Sun. A masculine sign and cadent falling house. The Moon is making no applying Ptolemaic aspect to the traditional planets. It is leaving the royal sign and its last aspect was to trine Saturn, and the first aspect will be to dexter square the rising Mars. "All-in-all", this not a great looking sky? "Heavens Above" the storm clouds are rising. I suggest you pack & prepare for the trudge of the incoming encounter. The lunar ripe moon on March 23rd, 2016, full moon eclipse chart also speaks loudly of uncertainties & difficulties culminating. Mars ruled and Saturn ruled activities stand to cover & blanket the coming quarter, as mutable conditions surround this bad moon rising appear very fluid. London will see the bad boys from the sky above as the two cowboys of the cosmos are centred on the MC. The royal Moon is setting into the abyss. The Lunar eclipse assumes the Midnight position, suggestion a transformation is taking place. All rights reserved - copyright Gregory Clare.